Our guest speaker was Gary Poyner who is Chair of Heart of England Astronomical Society and has been a dedicated observer of variable stars since 1975. At the beginning of his talk "Variable Stars: how and why they vary" he commented that "variable stars get a bad press (if they get any)". He thought this may be partly due to the fact that information on them tends to go out of date very quickly. This is in contrast to the many decades of observational records that a variable star observer needs to make to sometimes see any obvious changes to their light output. Basically, variable stars are stars that change their brightness over time. Depending on the type of variable star their luminosity can alter by a mere thousandth of a magnitude to twenty magnitudes in the space of a fraction of a second to many years. The magnitude of a star refers to a unit of measurement that astronomers use to gauge how bright a star is. A difference of one magnitude means that one star is approximately 2.5 times more luminous than another. Variable stars are divided into two basic types called "intrinsic" or "extrinsic". Intrinsic variables alter in brightness due to actual physical changes occurring in the star itself, whereas extrinsic variability is caused by the effects of another star in close proximity to the first. These two categories are then split further into five main classes. Three classes of intrinsic - pulsating, cataclysmic, eruptive and then two classes of extrinsic – eclipsing binaries and rotating. Gary specialises in a subgroup of cataclysmic variable stars known as dwarf novae. These consist of a pair of stars, in orbit about each other, where one star is a red dwarf and the other a white dwarf. The white dwarf star steals material from the red dwarf star and as it does so a disc of material, called an accretion disc, builds up around the white dwarf. Eventually, the disc accumulates so much material that it becomes unstable and excess dust and gas rains down on the white dwarf making it appear brighter. This process of the disc gaining material, becoming unstable, shedding material and then stabilising again is known as the "disk-instability model" and is thought to be the best explanation (to date) for the somewhat unpredictable brightening of these type of variable stars. Only recently a new nova was spotted by a Japanese astronomer on August 14th in the constellation Delphinus, the Dolphin. This is probably a classical nova outburst which occurs when a star similar to our Sun loses mass onto an orbiting white dwarf star. This build-up of material leads to a runaway nuclear reaction on the white dwarf's surface and a corresponding increase in luminosity of the white dwarf. 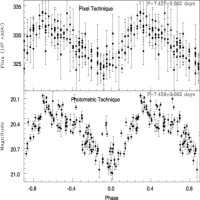 It is recommended that observers new to the variable star scene start with long period and semi-regular variables. Not only do they have larger variations in magnitude but they tend to be located near to bright stars which can help in estimating magnitude and are also plentiful in the night sky. Gary Poyner has a website with more information all about variable stars and observing them at www.variablestars.co.uk.